I learned the marinade for this tofu in my cooking class at the Natural Gourmet Institute. 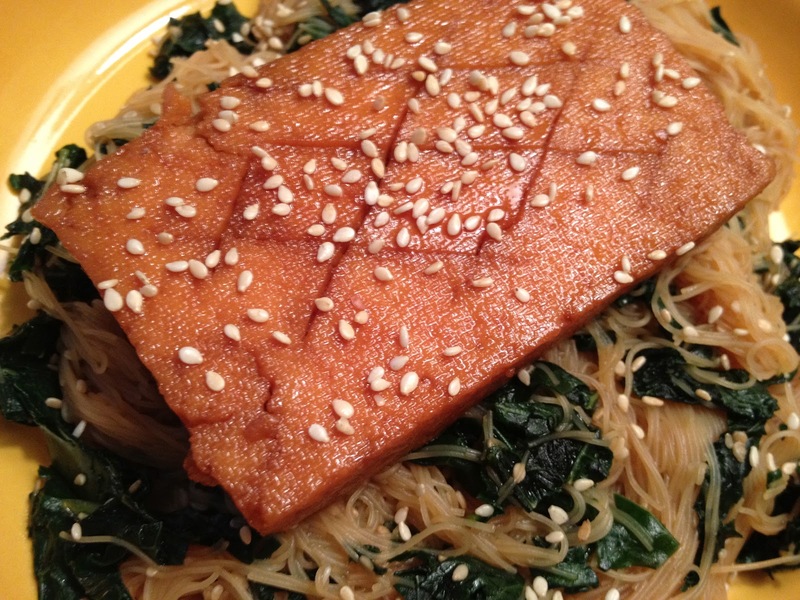 I thought it would be great over rice noodles tossed with kale and toasted sesame seeds. Bring a large pot of water to boil and prepare an ice bath. Take the center rib out of the kale. Using tongs, drop the kale into boiling water and blanch for 30 seconds. Place right right into the ice bath. Using a salad spinner, dry the kale as much as possible and then chiffonade. Set aside. Whisk together marinade ingredients. Cut the tofu into four slices and score the top. Place tofu with the marinade in a non-stick skillet and cook until it reduces by half. Toast sesame seeds. Make the pasta. Take the tofu out of the marinade and drop the noodles and kale into the remaining marinade and toss. Top with toasted sesame seeds. Enjoy! LisaThank you for the recipes, I recently purchased a tofu press, called the EZ Tofu Press thats affordable and available online. It works in 5-20 minutes….thought it would be of interest to your readers when preparing pressed tofu.